Donald Fithian Lippincott was born in Philadelphia, Pennsylvania, on November 16, 1893, to one of the most affluent Philadelphia families of the day. He attended the Episcopal Academy before matriculating to the University of Pennsylvania in 1911. Early in his tenure at Penn, Lippincott made a name for himself as a world class sprinter. At the age of eighteen, after a stint on Penn’s freshman track team, Lippincott was granted a spot on the U.S. Olympic track team on the stipulation that he could find his own means of travel to Stockholm. Fortunately for the young man, a few generous Penn alumni volunteered to pay his expenses and he was able to go to the games as a supplementary participant. Pitted against the world’s best sprinters at the time, the unlikely Lippincott set a world record in a qualifying heat in the 100 meters with a time of 10.6 seconds; this time advanced him to the finals, where he would capture the bronze medal. He followed this performance with even more success in the 200 meters, winning a silver medal. For the next three years Lippincott was a member of Penn’s varsity track team, becoming a champion record-holder during a time when Penn athletes dominated the Intercollegiate Association of Amateur Athletes of America (IC4-A) under the coaching of the legendary Mike Murphy. The spring following the Olympic Games, when Coach Murphy fell seriously ill with tuberculosis, he told his squad that he would live long enough to hear that his team had won the championship. As the championship came down to the final event, the 200 meter run, Donald Lippincott had to win the race to give his coach one final team victory. Apparently that was all the motivation he needed; he won the final race of the day in a world record time of 21.2 seconds, clinching Penn’s third IC4-A championship in four years for the university and its coach. This victory was the last of an era; Mike Murphy died only a few days after hearing of his team’s inspiring triumph. 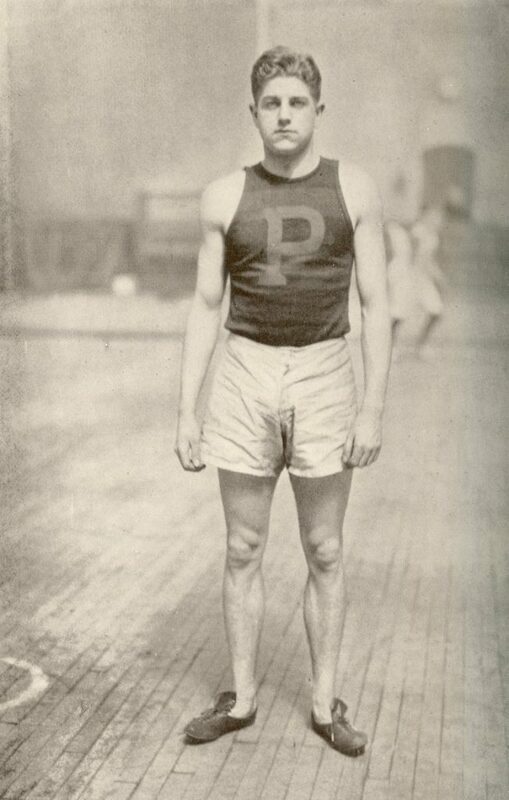 In his last years at Penn, Lippincott became a member of the 1600 meter relay team and gave another world record performance in 1915, the same year he was named captain of the track team. His sports activities also included service as head cheerleader and as a member of the board of directors of the Athletic Association. While at the University of Pennsylvania, Lippincott was arguably as successful off the field as he was on. He was a member of the Phi Kappa Beta Junior Honorary Society, the Sphinx Senior Society, the Delta Kappa Epsilon fraternity, and the Canteen Club. He also served on committees for various dances and class banquets and as the Bowl Man for the freshman-sophomore Bowl Fight. After graduating from the Wharton School in 1915, Lippincott went to work at Chandler Brothers and Co. as a securities consultant. After serving in the U.S. Navy during World War I, he returned from the war to work in the securities business as a general partner for Samuel McCreery and Co. Investments, and later as an account executive for Merrill, Lynch, Pierce, Fenner, and Beane Investments, both based in Philadelphia. Lippincott continued his involvement in track as an official and became an avid racquetball player in his later years. After a brief illness he died in Philadelphia on January 9, 1962. He was admitted to the Pennsylvania Athletic Hall of Fame in 1998.